There are a colourful cast of characters, character customization, crafting, special summoned allies, and Memoria, items that will reveal the backstory of Tibby and her people, the Zephyrim, and will help the player to reveal the secrets of her past. These items activate scenes that will show the player Tibby's memories. 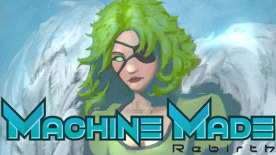 This game is developed for the classic retro RPG lover, someone who is waiting to sit down with a compelling cast of characters, level them up, and allow the story to unfold as they lead the heroes to victory, romance and truth, ultimately saving the world from destruction at the hands of a Machine God!